If you upload a photo that has a portrait orientation Jotform inexplicably rotates it 90 degrees so the result is everyone gets a cricked neck trying to look at the photo. So, along with everything else today .... try uploading a portrait photo with the File Upload function ... and see if you can get it to orient properly. No? Thought not. Unfortunately, this seemingly small issue is massive with anyone's clients who are paying for the services of photo delivery by form ... you may not think it but I'm on the front line and they request for the photo to be the right way up. Reasonable ... yes ... doable ... No! Consequently, the truly brilliant feature of photo upload from a smartphone is seriously compromised by the basic human requirement to have the photo oriented correctly ... and it not doing so. A correctly oriented landscape photo from my camera roll ... uploaded ... is totally the wrong orientation i.e. 180 degrees and so is commercially useless to me. This also happens for the multiple file upload. Why would you integrate such a brilliant feature ... and then not test that the orientation of a photo on upload is correct ... i.e. 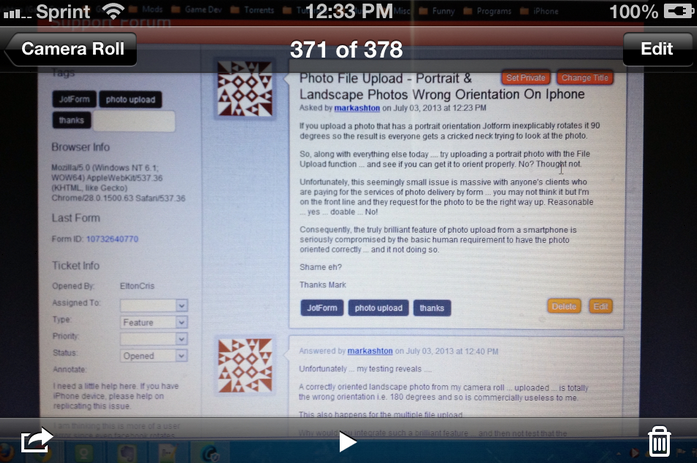 an Iphone ... photo in camera roll is perfect ... uploaded by jotform is upside down. Did you not test this? 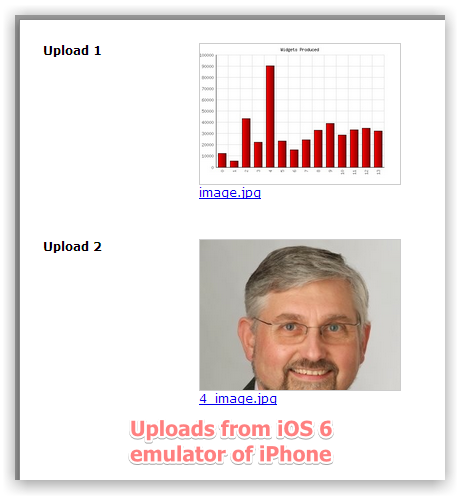 I do not have the iPhone to run some live tests, but I tried with the iOS emulator through browserstack.com. 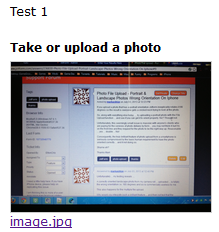 My test uploads went fine without any issues. Also, I run a live test from Android device, images were not reoriented. My images with portrait orientation were uploaded without any changes. So the issue might be related to some specific user case. Is this issue happening on the iPhone only? What browser do you use? I was testing (to start with) on an Iphone 4 with latest iOS6. 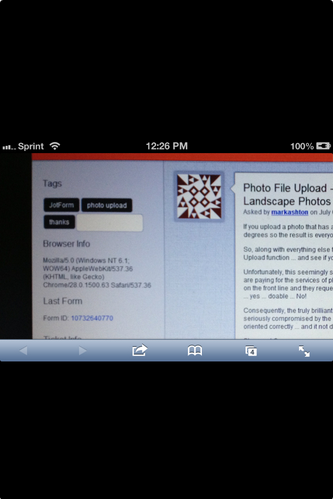 take a photo landscape that is corrcet way up in the camera roll ... jotform displays it upside down. Anyone else with an Iphone to replicate this issue? Look at that ... just a simple email from the Iphone to blog ... now why can't jotform's fancy upload ... take a photo ... take multiple ... blah... just do that? I have no commercial viable solution the way it is ... if I can get the photos the right way up ... I'm in business ... can anyone help please. I have forwarded this to my colleagues who has this device for testing. They aren't available as of the moment so it may take a while before they could get back to you with this. I have also escalated this to our higher team for a review. Thanks for the additional details by the way. We do not have solution as of the moment since we do not have options for rotating uploaded images. One of my colleague, Khrisell just tested and it seems to be fine. Images displays fine as expected. Note that portrait images are actually stored sideways on your iPhone just like in any digital cameras. You can see that when you view the file on windows desktop. Your phone will display them correctly, simply because it "exactly knows" how you took them, but the computer that you're sending them to does not "understand". I think this has been consistent on every iPhone devices but not quite sure about this. So I believed this is more of an iPhone issue. Portrait Mode: It is uploaded as it is. There's no rotation happens from our end so this is it's normal view. My suggestion to this would be to add a roration button in the submissions page where users can rotate portrait images manually and automatically saved the changes just like what facebook has. This would help I guess. 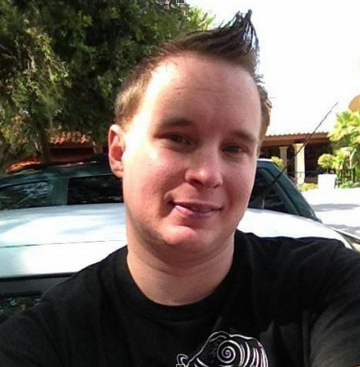 Respectfully, I'm a mobile developer and deal w ith mobile stuff and photos all the time. I'm afraid what you've said above is utter rubbish. 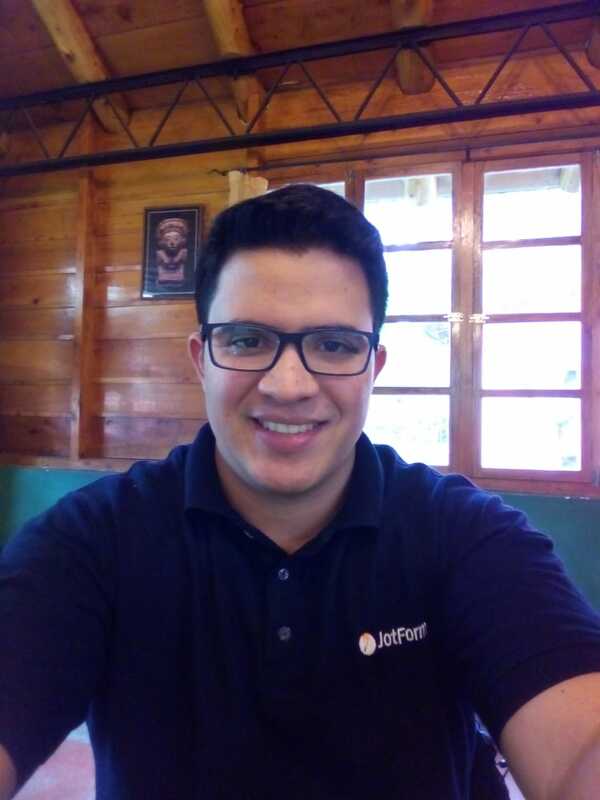 If you send a portrait photo from an Iphone ... use filepicker.io ... send the photo by email ... or by picture message ... then in all cases it will turn up with the orientation correct. Only with the Jotform file upload function does it turn up on its side... as you've proved above. 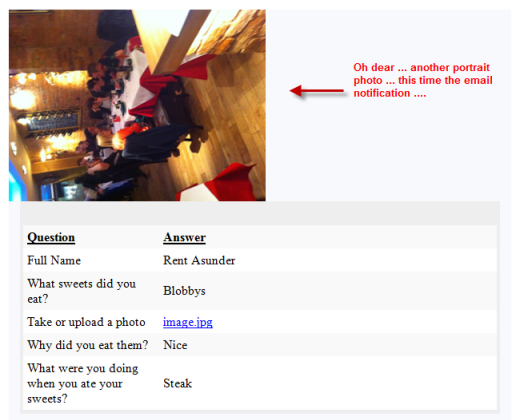 I think it is something to do with the metadata in the photo. No one's going to go into submissions and rotate all their photos ... unless they've got nothing better to do .... They're going to use Formstack which works properly. Look ... the problem is with the jotform upload function ... evrything else works. 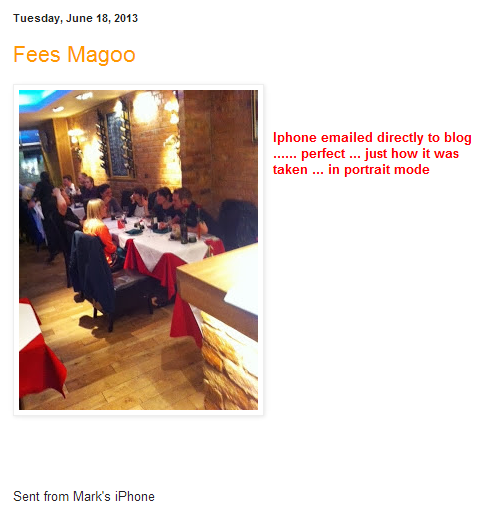 Thank you very much for provided details Mark. 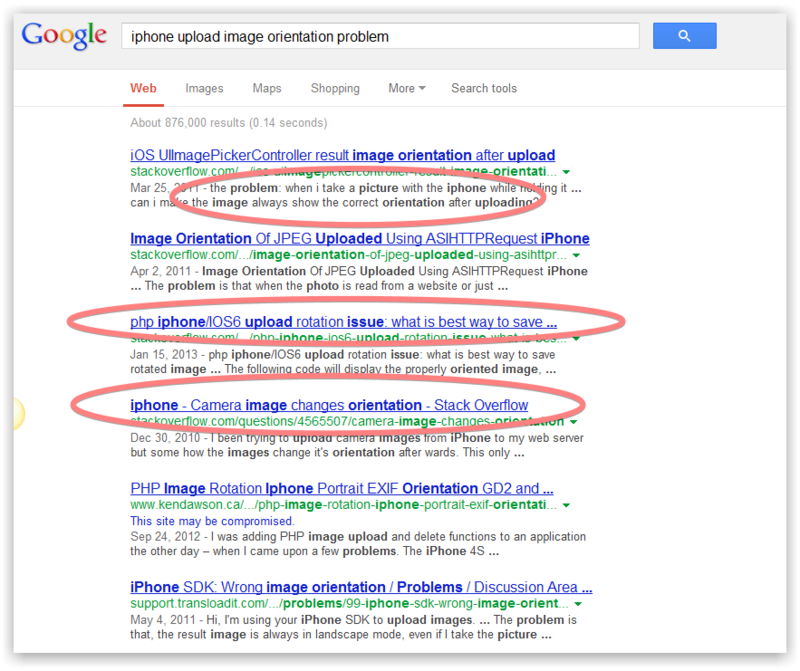 We have checked this further with Elton and found that the iPhone orientation upload issue is common over the web services. When you see the correct orientation on the filepicker tool or any other service, it means that they have added some extra code to handle the iPhone uploads. This is not that much a JotForm issue, but we totally agree with you, it is crucial to have mobile ready solutions, and the iPhone uploads should be fixed. 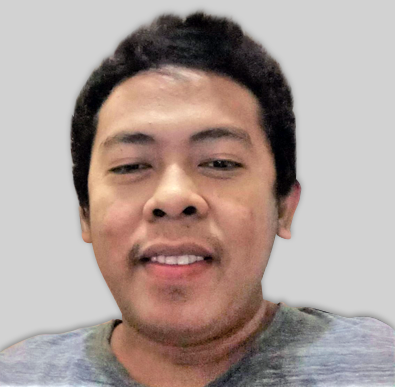 We have submitted a ticket to our Development Team. So you will be informed via this thread once we have any updates. Thank you. Thanks for all your help so far. I've done some research for this issue. First off ... all the above is irrelevent if you are on an Ipad or Mac ... there is no rotation issue!! I checked the thumbnails and images through Safari browser on Ipad and ... portrait photos are portrait ... no problem ... crazy eh? 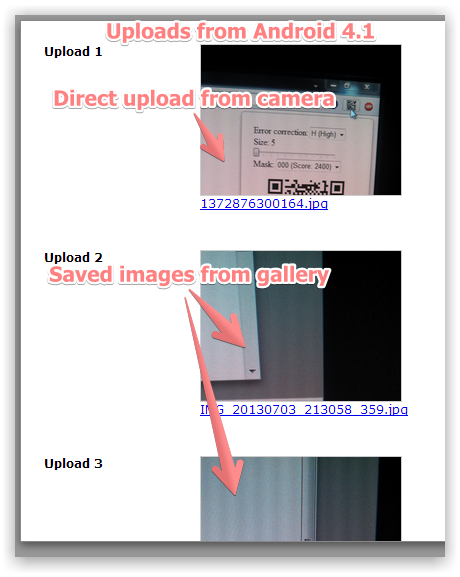 In a nutshell ... the jotform file upload function, when used for taking/uploading portrait and 50% of landscape photos on an Iphone, will display the photos in the wrong orientation on all windows machines, i.e. 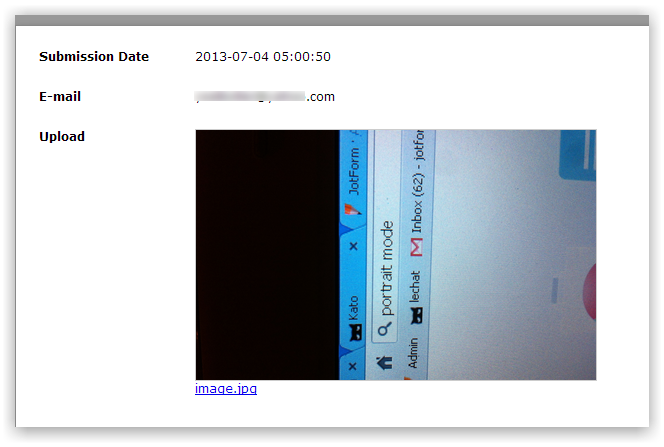 when viewing jotform submissions, thumbnails on html reports, images in email notifications and autoresponders ... always. 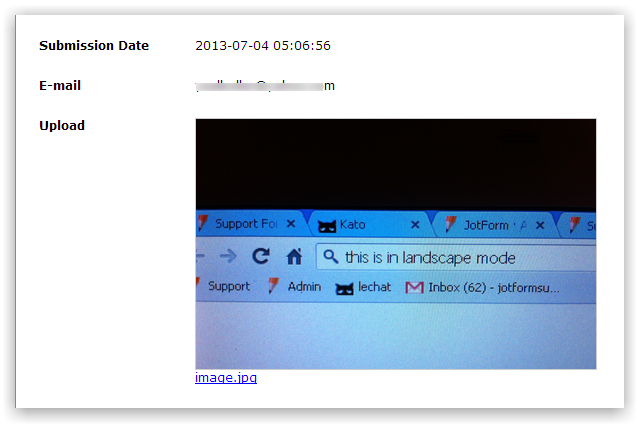 So, 75% of iphone uploaded photos from the jotform upload function will be of wrong orientation on a windows machine ... that's a lot of machines. So, is there a techy solution to this conundrum? Can you advise me what the file upload function is using from a software point of view. Hi Mark, I decided to check this out for myself based on what you mentioned here " If you upload a photo that has a portrait orientation Jotform inexplicably rotates it 90 degrees so the result is everyone gets a cricked neck trying to look at the photo. " and also because I have an iPhone myself so this will help test and check it for better accuracy. I was only able to replicate this problem on Portrait Mode. The Landscaping Mode while uploading an Image is working perfectly for me though. I think that this is a small but correctable program issue and it's just a matter of getting it to that point which will probably take some time to configure. As previously mentioned we've opened a Ticket reporting this to our Development Team so I'm pretty sure we'll be able to figure out something to correct this for JotForm use though it might not be immediate. Also thank you for the above provided information, we will certainly pass along that information and let you know what's going on in regards to this. At the moment I am not sure of a fix for it yet to workaround it but it will definitely be looked more into to help correct it since we've seen this happen on numerous occasions. (1) I first took a screenshot of my desktop computer in Landscape Mode. Note where the Sprint, Time, and Battery are at first but then black containers are added above and below when I swap to Portrait Mode. (2) Next I cloned your form and used a copy here http://form.jotform.us/form/31844752316152 for testing purposes and accuracy on the same issue. I then filled in the form on my iPhone 4S (iOS 6.1.3) and attached the same image via a Single File Upload button you had on the form which I didn't change then submitted it. As you can see in the Image File below it does indeed rotate the Image 90° which is notable when it gets attached. However, it's irrelevant since that is only a thumbnail of the image. (4) I then checked this via my Submissions and it appears to showing with no Problems for LandScape Mode. I checked this at first on my iPhone and viewing it and then on my computer. (5) I had also done a reverse test with just a Portrait Picture prior just to check it in both Modes. Now when I checked the first picture I sent in Portrait Mode this is when I found the same problem as you. Only inside JotForm when viewing the Image that was uploaded from iPhone was where the Picture appeard incorrectly as I can confirm that this is happening. 1) The screenshots you used ... you mean a photo of the screen with your Iphone ... not a screenshot that was a screengrab .. looks like a photo. So, I'll assume it is. 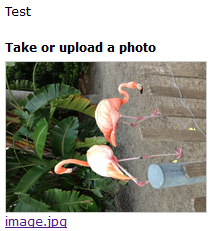 3) Try looking at the photo of the flamingos on an IPad ... it will be the correct way up. 4) At this very moment I am looking at the notification email simultaneously on an Ipad and a windows machine. The orientation is correct on the Ipad but incorrect on the win computer. This post have a ticket assigned to our dev already. I suggest we wait for update regarding this issue from them. I am sure our colleague KadeJM will also provide his reponse when he is back online(after he did some test already on his device). I do not have the right devices to do an appropriate test on my end (for this reason I could not help much on this one). 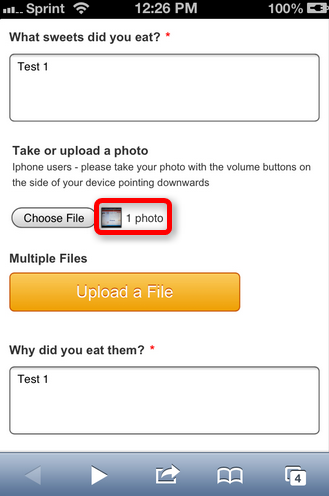 The ticket is still open, so we do not have any native solution that can fix the iPhone portrait mode image uploads. We will update this thread once it is implemented. 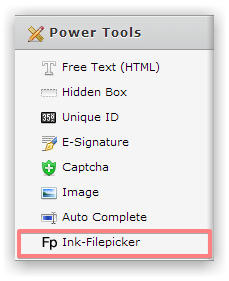 In the meantime, you can use an Ink-Filepicker tool to accept image uploads, that tool is correcting the image orientation. The problem is that when a photo is taken with a smartphone ... the smartphone can be in different orientations. All smartphones have a gyroscope ... tells the smartphone what orientation it is at. The smartphone writes this data to the photo ... it is called EXIF data ... so if the service on the server side can process the EXIF image data ... the orientation of the image will always be correct. Jorform native upload does not handle EXIF data ... and therefore is little use with regard to photos uploaded from smartphones ... it can't be used for that unless you want to be the laughing stock with your clients because you deliver all photos on their side. So, to answer your question ... What was the solution? Your question should be What is the solution? 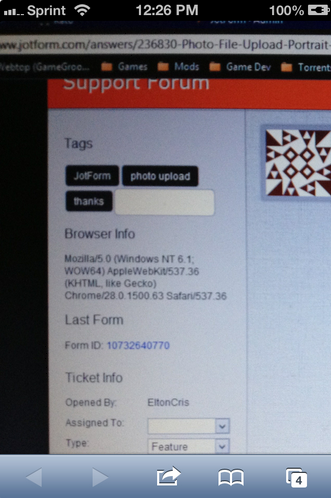 ... the answer is that Jotform have to handle the EXIF data of the image on upload ! Then ... all your photos will be the correct orientation. Can you do this please ... your native upload function should be able to handle EXIF data. 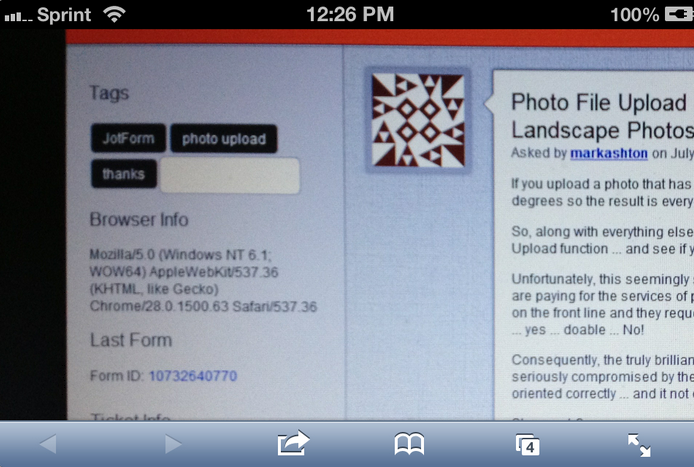 My pics were uploading with incorrect orientation, so figured someone had already reported this. It's Feb 2014 & problem still exists. I took the photos w/ an iPhone 5S, and uploaded to FB from my Windows laptop. Log on to your Facebook account. You can only rotate or edit photos from the account that was used to post them. Navigate to the photo you wish to turn. If you posted it recently, you may be able to find it on your wall. If not, click the "Photos" link on your profile page and find it from there.Click the photo in question to view the larger version. Look in the lower right corner of the black section surrounding the photo. You should see two icons, each a rectangle with an arrow. The left icon rotates the picture left, while the right icon rotates it to the right. Click on the appropriate icon to rotate your picture until it faces your desired direction. Facebook saves your changes automatically. This is an old thread, please open a new one, we will be glad to assist you.